The world across traditional and new media is exploding with various forms of influencer marketing and native advertising, where paid advertising and content are blended so closely into the content — from blogs and podcasts to newspapers and radio — that consumers often do not recognize it as sponsored material. It can fool consumers into accepting paid as earned, and it can bypass ad-blockers. However, the Federal Trade Commission has issued guidelines now that give specifics regarding how this should be done. 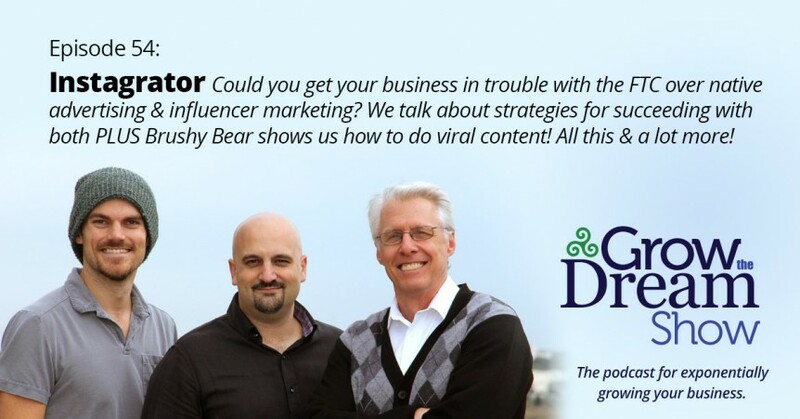 We also discuss the use of the digital Brushy Bear character as an influencer in a video that has gone viral on social media. And, finally, Josh went all “Instagrator” and David and Rod because the duo were off topic…again. Brew of the Day: Death Wish Coffee, a small business whose ad was aired in the Super Bowl, thanks to Intuit. Is ad blocking the biggest boycott in history? FTC indicates that enforcement will be focused on advertisers and their agencies more than bloggers/influencers. Full FTC endorsement guidelines here. Another tool from Josh: Music for Programming.